These are ideas of what you need to do for yourself. Remember to get serious information and check out what your GDPR compliance resources need to be and what action you’ll need to take. Vendors and businesses will be adding more detail about how and why they use the information they collect about you, how they share it, who they share it with, and your rights with that data. First, this is a free checklist I love that helps to make it simpler. 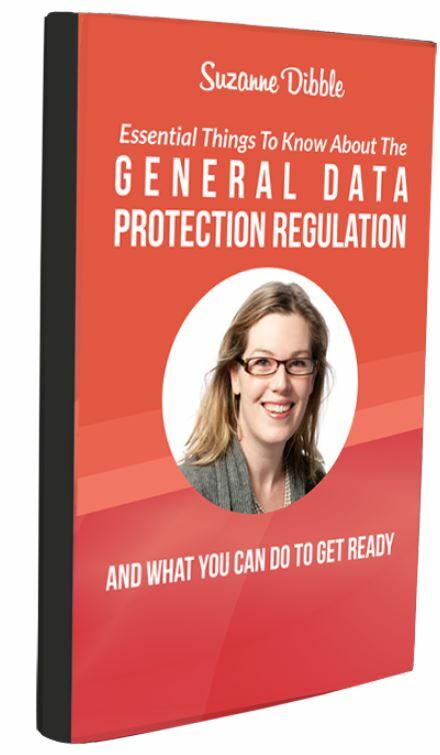 I’m sharing what I found when I listened to this fabulous speaker and downloaded her checklist that guides you through the simple steps you need to take to be GDPR compliant and to keep the regulators at bay. AWeber, who is my email server, has prepared a general walkthrough of the GDPR, including what it means for your email marketing business, what AWeber is doing to prepare, and actions you can take right now to help you prepare for the changes. You’ll want more information! So check your own email server and other online vendors that you use. “According to a recent study, only 36% of marketers have heard about the new General Data Protection Regulations (GDPR) that will take effect on May 25, 2018. GDPR is designed to hold organizations (like Leadpages & your business) more accountable for keeping personal data secure and outlines new procedures for how you collect data, store, and use data – as well as the rights individuals have to protect, access, and modify your data on them. GDPR becomes fully enforceable on May 25, 2018 (the date your grace period runs out). GDPR Compliance for Online Businesses Selling Courses and Memberships https://ambitionally.com/online-business-tools/gdpr-compliance-online-businesses Find out some answers to these points? But your business is responsible for taking care of finding out about GDPR compliance resources. You’ll need to review your data practices with the new regulations to make sure you’re in compliance. It’s highly recommended that you take a good educated look at your current email marketing practices and make sure that you’re doing what the new law requires. Under the General Data Protection Regulation (or GDPR), as a small business, you’re required, as are all businesses that hold others’ personal data, to offer them certain information in relative to the lawful grounds for ongoing processing of their personal data. To fulfill that obligation, we need to revise make sure our privacy notice sets out how we collect and process their personal data, for what purposes their data is used for, the legal grounds of processing such data, how data secure is kept secure and their rights in relation to such data. If you have a double opt-in for email subscribers, it’s all you need – NOT TRUE! If your email server is compliant, then you are also – NOT TRUE! But it affects anyone who runs an online business and collects data (and opt-ins!) from those who live or visit the EU. This is serious…If you do not comply, there can be fines! GDPR can be awesome news because it could stop a repeat of the Facebook/Cambridge Analytica issues. BTW – My Facebook account was part of the group taken by Cambridge Analytica, because one of my over 2500 friends had used an app they had put out to trick everyone! That’s why this is important to remind us to set ourselves up to follow the law and treat our email subscribers with respect, by implementing the changes. It’s a lot more to learn but it’s a good idea for all! – and it’s legally required for those in the EU from May 25, 2018. You’ll probably be getting a lot of important information on what you need to do in your own emails! Be sure to pay attention!! Disclaimer: This post is for informational purposes only, and you should not consider it legal advice. I recommend that you seek legal and other professional counsel to gain clarity on exactly how the GDPR might apply to you. In the spirit of full disclosure, some of the links in this post or email may be affiliate links, which means I may receive compensation from some of the sites or people listed here for referrals, as their thank you for sending you their way. However, I never recommend any product solely for the reason of receiving commissions. ← Do You Really Want To Boost Your Facebook Business? I’ve been trying to make sure I’m compliant. Thanks for sharing these resources that we need to read to make sure we are doing it right. It sounds like something that is pretty serious if you don’t do. I do not live in Europe but if I did this is definitely something that I would have to look into. I do have a couple of friends that do live in Europe and I will have to show them this blog post. You have to even in the USA… unfortunately something we all have to do! This is on my to-do list for my business. Thanks for the reminder. This can really be a good law since it protects more data. This can also affect business as this can limit the information they can gather. Sounds like the EU is trying to protect everyone and be fair about how they are going about doing it. Hope everyone know about it and gets on board. Good information to keep in mind! Information is way too easy for hackers to steal these days. I need to update my information and get ready for this to go into effect. I have a lot of readers on one of my sites from there. I don’t know why I didn’t know about this beforehand. I’m so glad this was helpful, Terri! I’ll keep this in mind. I honestly do not know much about this, so I’m glad I read this post. I’m not sure if I have subscribers in Europe. I’ll have to see if there is a way to know that information. We don’t have that here in the states (that I know of) but I’m sure it’s helpful info for those in your country. Hi Heather – I am in the states – and the main thought is that if you have any possibilities of EU subscribers, you need to take care of this to avoid any possible fines 🙂 Thank you for your comment! Thank you so much for thing, GDPR is slowly driving me just a little crazy. I’m trying to get things sorted. I sure do know that feeling with this, Sarah – That’s why I’m just going to give in and buy the class to make sure I’ve got it for myself and the people I train for the online businesses! Thank you SO much for this. This is something I need to sit down and figure out this week. What a chore. just when I thought I was done for a bit! This is such a critical issue right now. It seems that there are data breaches and misuses everywhere. THIS is all so confusing to me. my Wife was telling me about It last night and I’m lost so this is so helpful! I have been so busy so much preparing for my daughters basic training graduation from the Navy, that I haven’t even heard/read anything about this! I’m so glad that I did, I’ve got to get busy! With so much focus on privacy concerns and security I am glad to see laws being enacted to protect our information. I have a feeling we’ll be seeing more of these. I so agree, Tomi, now we need to keep on top of it as businesses! This is my first time to learn about this and glad I was able to drop by on this post. Very informative. It’s nice to learn something new today about the General Data Protection Regulation. GDPR has been a thorn on my side for weeks now. I think I’ve done what I can for compliance, there’s just so many things! I hope I did it right, these resources definitely help. I really had no idea about any of this until reading about it. It is certainly something that should be done and really it protects everyone. Thanks for all the information. I’ll be saving this for later. Thank you, Laura – I’m still working on mine little by little! This is so helpful! I’ve been very confused about GDPR and what we need to do. Thank you, Stephanie – I’m still putting it together for my own business – Whew! This is a lot of information. It isn’t an issue that I have to deal with and I am glad. It seems intimidating. I know that feeling, Rachel! I’ve been getting closer day by day – today I am taking care of the ‘I agree’ checkbox on my free opt-in forms and then I continue on! I wish there was some kind of checklist to make sure I go over everything. I downloaded a plug-in, but I hate the pop-ups. Ugh. I had been struggled to find a post about this before coming across your post. Thank you so much! My dad and mom would be glad to read your article. Very informative even though I live in the United States, this information is good to know. I didn’t know what any of this was so your post was so interesting. And so informative! I know I have heard a little bit about it. I will have to check this out as I know it’s important when running a blogging site and if I wish to ever do things with Europe. This is such a great resource! There is so much information out there floating around for influencers and it’s so hard to really distinguish what is and isn’t true and/or relevant to us. I’m definitely bookmarking this post! Great resources for making sure we are all compliant. Thanks for compiling it for us. This is a tremendous help. Wow thats so interesting!! I am not sure if that effects me the same way, but thats so awesome to share this so people understand more! !